Walking is easier the less you carry, and shaving off a few extra grams becomes more important the further or faster you want to travel in the hills. But the most successful outdoor products balance the need to reduce weight with the need for comfort and durability, and any outdoor product that manages to balance all those priorities is a product every walker needs to know about. To meet these needs for 2018, Berghaus has released its Fast Hike range of three new rucksacks, all intended to be lightweight, durable and comfortable. Trail managed to get one of the first samples of the Fast Hike 32 and I’ve used it out on the fells for the past couple of months. As the name suggests, the Fast Hike 32 has a capacity of 32 litres, and there are also 45- and 20-litre versions in the range. The packs are built around a new carry harness that is designed to allow you to ‘wear’ the load, rather than simply carry it on your back. So you get a breathable honeycomb mesh on the body contact areas and a synthetic panel of black foam padding that allows the back system to mould to your back. The shoulder straps and hipbelt are quite wide, so they also mould to your body shape easily. The overall effect is that the pack tends to hug your back when adjusted. But this is a one-size unisex design, so it is possible that female users may need a different fit. The body of the pack is made from 100 denier Robic Alkex nylon, which feels far more robust than most other lightweight rucksacks. To save weight there is a roll-top closure rather than a conventional buckle lid. When opened this allows for exceptionally easy access to the main compartment, and while not as quick to close as a single buckle lid, it does roll down reasonably easily and is secured by two side buckles. Importantly, this roll closure means the top of the pack is well protected against the rain. Most rucksacks have a few zipped pockets for smaller items, but here such things have been stripped away to reduce weight. But you do still get a small zipped pocket for valuables that’s attached to the inside of the pack with press studs, so can be removed to save weight. Apart from that you just get a pair of side stretch mesh wand-style pockets, two mesh pockets on the hip belt (one with a zip), and two mesh pockets on the shoulder straps. So most of your kit is going into that main compartment. The external compression straps provided are more useable than the thin cord used on some packs and yet far lighter than the wider webbing straps that feature on conventional packs. There are two strips of useful red daisy chain cords on the front of the pack to allow trekking poles or other items to be strapped to the outside. There is also a large pocket between the back panel and the body of the sack where you can stow a hydration bladder. I have been using this pack for my quick hikes over Lakeland fells, which are often early evening jaunts after work or longer day yomps. Overall, I’ve found that all the features do work well. The body-hugging fit combined with the low weight of just 602g means this feels great on the body, particularly when fast hiking. But you don’t get the airflow of some heavier packs, so for warmer weather I’d prefer a trampoline-style back panel. Also a little more care is needed to pack it, otherwise items can dig into your back. As the hipbelt is quite soft and flexible it cannot support heavy loads well, so it is important to keep the weight of the contents relatively low to maintain comfort. Having all your gear in the main compartment does mean that when you need a map, hat or a pair of gloves you have to open that roll-top lid, which is more faffy than a buckle lid and more hassle than just grabbing an item from a conventional lid zipped pocket. Also between showers I’ve got into the habit of stashing my waterproofs into those stretch mesh pockets that are so often fitted to rucksacks these days, but of course on this pack that isn’t an option. 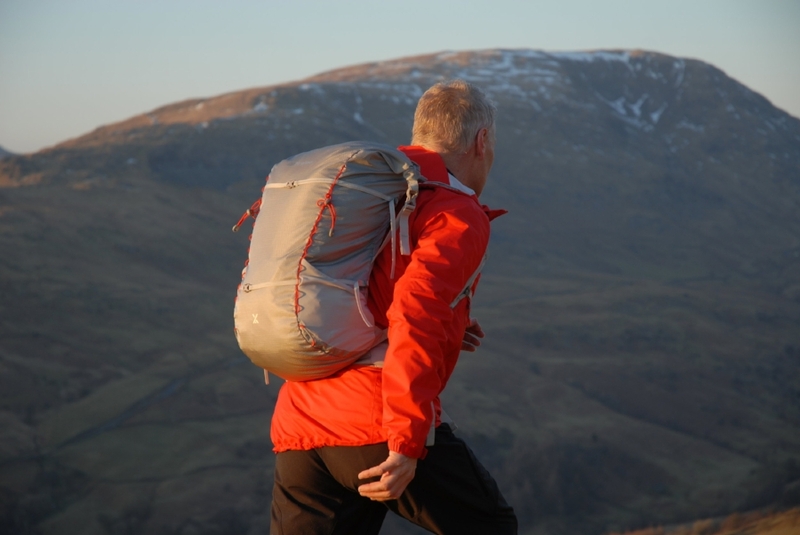 For longer walks into terrain I am less sure about, or when heading into mixed weather when I just want everything to be easily accessible, I’d choose a more conventional pack, such as a Berghaus Freeflow for example. But for speedy hikes this is great and I will certainly keep using it for that style of hillwalking. The price is also comparable and even lower than other quality packs of this size. The Fast Hike 32 is an excellent choice if you want to save weight while still preserving comfort and durability... but heavier rucksacks tend to offer extra features and more fit variations.